Out here in flyover country, there’s a controversy brewing in one of the largest and wealthiest public school districts in St. Louis County. Â The Parkway School District covers quite a bit of territory across some of the most valuable real estate in the St. Louis area. 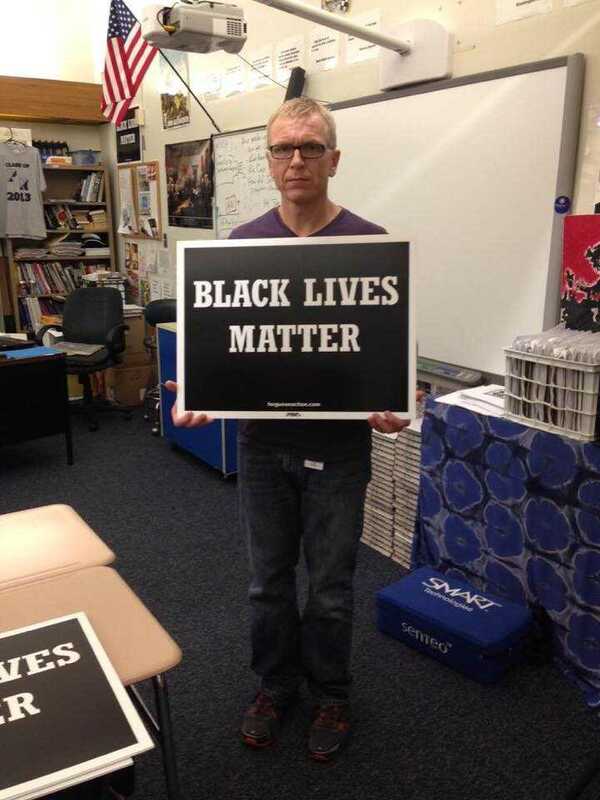 Â At one of its high schools – Parkway North – the teachers have gone on an online crusade with the now familiar here in St. Louis black and white #BlackLivesMatter placards. Naturally, this was picked up on Facebook, and has become a touchstone in the fallout from the Michael Brown shooting in Ferguson, which is a few miles east of Parkway North’s territory. Â The consensus of the posts thus far is that such politicking does not belong in the classroom. What the world does not know, is that of the Parkway high schools, North does have a sizable African-American population. Â It does happen that when in minority, sometimes such students consider themselves marginalized. Â Whether it is intended or not, it happens, and it is most unfortunate. Â And in a city where the people gravitate to self-segregation this invites all sorts of speculation and paranoia. The thing about the #BlackLivesMatter signs is that they have been popping up like weeds all over the St. Louis area – and not just on the lawns of blacks, but on those of upper middle class white liberals who are known to champion such causes as abortion on demand, the leading cause of death among black babies. Â The online community may argue about this, but this writer passes three such signs travelling the seven blocks to Church. Â Those houses are not black owned. Â They are white liberal owned. This part of town is not the Parkway School District, nor is it all that close to Ferguson, but it is not that far from the “dividing line” if one will that runs through the middle of town. Â Racial tensions can be stoked by these measures. Â What these people fail to recognize in their zeal for feeling guilt on the race issue, is that they advocate for the very social programs and institutions that destroyed the black family, and are continuing to destroy the black family. Yes, #BlackLivesMatter, just the same as American Indian, and Chinese, and Aborigine, and tribal Middle Easterners. Â All lives matter. Â The placards, far from being about peace and bringing us all together, divide us in ways the very people professing the sentiment don’t understand. Â Equality is not about singling out one group over another, but treating all people the same. 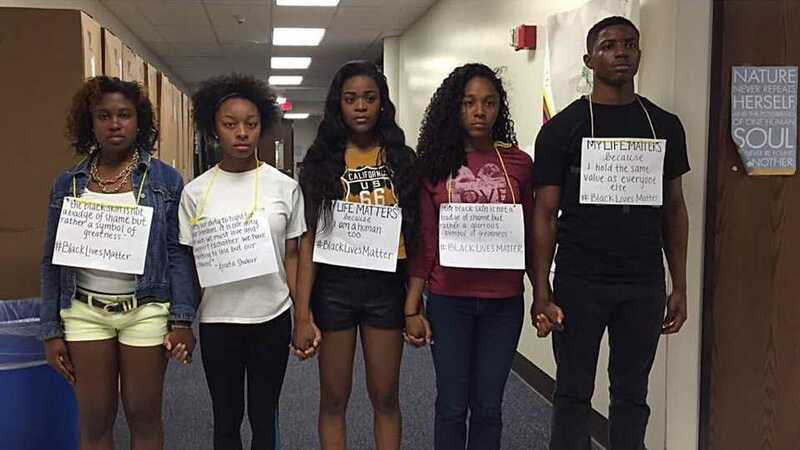 All lives matter, and yes, that does include blacks. Â That is what belongs in the Parkway classrooms. Â That is what people who do not live in this tiny sliver of the world will protest from afar even as the rest of us are doing our best not to pay too much attention lest the liberals think they are in the right. Writer’s note: By the way, there is a robust private and parochial school segment in St. Louis. Â A lot of us are not exposed to this sort of thing because our parents made the sacrifice to send us to one of them. [Watch] ‘Death To America’ Chant From Iranians Claiming Victory Over U.S.
You Want To Clean Up America? Start By Taking Out The Trash!